Wow, can anybody say rain!!! We can finally see the sun. 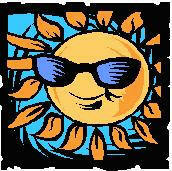 Yes the rain hampered a few of our major events although summer is here. We have scheduled an event to make up for the one lost; an indoor Hawaiian Luau on July 12th (check your calendar for further information). On a bright side, DateAble had a Sexuality and Intimacy Discussion group held at the office on the tenth of May. The group was lead by Sexuality Education Consultant Mary Ann Carmody. We had approximately 12 individuals show up with very different views. The topics ranged from where the line is between complementing a person to flirting with a person. Everyone discussed the big brother syndrome when just before a relationship becomes serious the other person states, "oh I just want to be a big brother or big sister to you.” Mary Ann will be returning to the DateAble office on August 5th at 7:00pm. Topics can be submitted to me in advance for discussion and depending on the group size and the ratio between men and women the group may be divided into gender groups for an hour and then reconvene for the last hour. Never feel that you are above a group even an old married guy like me learned a lot. DateAble is what you make DateAble out to be; for some people DateAble is just a match making vehicle and for others DateAble is a networking tool. Others are just looking for friendships and trying to understand where they fit into in this world. I believe the third option is the healthiest because friendship can always bloom into a flower that we could never imagine. So get out there an d make friends because you never know where it may take you. Enjoy the music of local artist Patty Reese during this free, open-air concert. Note: The concert is held in a grassy area, so bring a chair or blanket if you will be sitting on the ground. RSVP by July 7, 2003 to DateAble office. For cancellation information due to bad weather, call 240-777-6821 after 3pm on the event day, 7/10/03. With the unpredictable weather during the spring, we’re trying an indoor, evening dance with picnic fare for dinner! RSVP by July 10, 2003. Share an evening with some good music and new friends. The group is Rockin’ Pneumonia (Oldies Rock). FYI, there are also concerts on 07/03, 07/24, and 07/31. RSVP by July 15, 2003. Back by popular demand! If you missed the June discussion, plan on joining us this time. RSVP by August 4, 2003. Enjoy the music of The Cravin’ Dogs (“melodic, roots rock n’ roll”) at this free outdoor concert on Lion/Tiger hill at the zoo. FYI, there are also concerts on 7/17 and 7/21. RSVP by August 19, 2003. Meet with friends for dinner and great conversation. RSVP directly to Marty Fixman who is organizing this event. If you haven’t attended yet, try it out this month! RSVP by September 4, 2003 to Marty Fixman at 703-768-5254 or via e-mail at Fixman@erols.com. It’s an away game so we’re not all traveling to Atlanta, but you’re welcome to travel to the DateAble office to casually watch the game. RSVP by September 10, 2003. Gather for a casual, relaxed evening of conversation and music. Bring your favorite music CD’s. RSVP by September 24, 2003. National Therapeutic Recreation Week will be observed from July 6 - 12, 2003 around the country. This week is intended to raise awareness in each person’s community about the recreational opportunities available to them. Below are the contact telephone and TTY numbers for three local counties. If you don't see your county listed here and you are interested in learning about similar programs, contact your local county government office. Telephone 240-777-6960 or using TTY 240-777-6974. Prince George's County Therapeutic Recreation Programs Telephone 301-454-1480 or using TTY 301-454-1493. Telephone 703-324-5532 or using TTY 703-222-9693. J Thank you to Mary Ann Carmody, RN, BSN, and Sexuality Education Consultant, for facilitating an interesting and informative discussion of sexual intimacy issues for DateAble members on June 10th. Mary Ann is also a member of the DateAble Board of Directors. Editor's Note: This is your newsletter, so to see your name in print, submit an article or event idea. We'd love to hear from you! Just ask David Baquis, Gregg Donaldson, Edward Jones, Christyna Hunter, and Leonard Weirich who all have had their suggestions or articles included in the current or previous newsletters. This guide focuses on people with disabilities and activity limitations successfully evacuating buildings. Its goal is to help you strengthen your evacuation preparedness. It does not address area evacuations sometimes in response to hurricane and flood warnings. If you answer yes to any of the questions in the box below, you should read this guide. Will you need assistance in an emergency evacuation? Yes No Limitations that interfere with walking or using stairs (joint pain, mobility device user-wheelchair, canes, crutches, walker). Yes No Respiratory (cardiac conditions, asthma, emphysema, or other symptoms triggered by stress). Yes No Emotional, cognitive, thinking, or learning difficulties (may become confused when dealing with unfamiliar and unusual activity during an emergency, lose sense of direction). Yes No Vision loss (may require assistance in learning the emergency evacuation routes). Yes No Hearing loss (may require modification to the standard way emergency announcements, notifications and instructions are provided). Yes No Temporary limitations resulting from, but not limited to: surgery, accidents and injuries (sprains, broken bones, and pregnancy). Yes No Do you rely on technology or medication which may not work in an emergency (hearing aids, wheelchair, gas mask, elevator, lighting, sounds)? Editor's Note: Thank you to DateAble member David Baquis for suggesting this guide be introduced to DateAble members and staff. With the very rainy and unpredictable spring weather, the annual picnic was cancelled . To fill our need to picnic food and a party, we're having a special Aloha Picnic and Dance on Saturday, July 12, 2003 at the Willoughby Apartments party room. See the calendar on the other side for more details. We'll be having picnic food and one thing we couldn't have at an outside picnic, a DISC JOCKEY! Call the office for details and to RSVP. While the current calendar covers the events for July, August, and September, a special event in October may be of interest to you. Making Connections is taking an overnight trip to Busch Gardens Amusement Park in Virginia on October 18 & 19th. A few seats are available to DateAble members for this special trip. Some of the details need to be finalized, so we'll keep you posted with new developments. Call the office as soon as possible if you are interested in going. We may get better rates if we have more people on the trip. With the very icy winter and the cooler, rainy spring it may be easy to forget how damaging the heat can be to your health. Here are some tips from the Centers for Disease Control about managing in very warm weather. A full list is available on their website at www.cdc.gov/nceh/hsb/extremeheat/. ­ Drink more fluids (nonalcoholic), regardless of your activity level. Don’t wait until you’re thirsty to drink. Warning: If your doctor generally limits the amount of fluid you drink or has you on water pills, ask him how much you should drink while the weather is hot. ­ Don’t drink liquids that contain caffeine, alcohol, or large amounts of sugar–these actually cause you to lose more body fluid. Also, avoid very cold drinks, because they can cause stomach cramps. ­ Stay indoors and, if at all possible, stay in an air-conditioned place. If your home does not have air conditioning, go to the shopping mall or public library–even a few hours spent in air conditioning can help your body stay cooler when you go back into the heat. Call your local health department to see if there are any heat-relief shelters in your area. ­ Electric fans may provide comfort, but when the temperature is in the high 90s, fans will not prevent heat-related illness. Taking a cool shower or bath, or moving to an air-conditioned place is a much better way to cool off. ­ Wear lightweight, light-colored, loose-fitting clothing. ­ NEVER leave anyone in a closed, parked vehicle. Editor's Note: Thank you to Leonard for donating some return address labels to the DateAble Washington office.